Writing an event description is easy. Writing the right event description is hard, but we can help, and we've got a checklist you can use the next time you're tasked with writing a description of an upcoming event. The goal of an event description is to maximize the attendance of people who will enjoy your event. This is different than just getting people to your event. After all, events are a lot of work, and building an audience for your events means great word of mouth. Your organization’s brand, or your event brand, matters. For events such as the annual "Redcoats and Rebels" reenactment at Old Sturbridge Village, which is an outstanding event, stronger attendance means more engagement with history and perhaps, over time, more members and more volunteers, all things that help you further your mission. That's a small part of the crowd pictured above. For a fundraiser, where the goal is net profit, stronger attendance helps boost sales of sponsorships and tickets in future years. You not only want people to attend your event, you want to exceed their expectations. When you do, they'll post to social media and tell all of their like-minded friends what they missed. 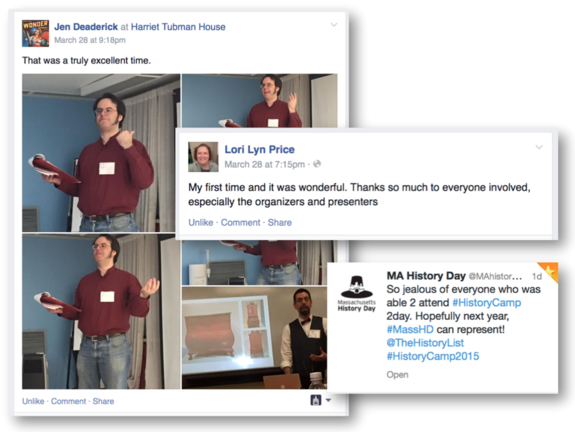 (The posts pictured are from History Camp Boston 2015.) They'll also sign up for event notices and put the date for next year’s in their calendar. Maybe they will even volunteer to help. And as the date approaches, they will start telling their friends, posting to social media, and getting a group together. One of the impetuses for starting The History List was attending an outstanding reenactment that wasn’t very well attended. I knew about it because there was a plywood sign posted in front of a local firehouse that I happened to drive by. But how were others expected to find it? Then a few weeks ago I was with a few others who are also really interested in history and we showed up late for an event that we would have really enjoyed. And the organization that put it together put a lot of work into it. We knew about the event, and we planned to stop by, but we didn’t really understand the event or the fact that you needed at least an hour to participate. Back to that in a minute. Let’s segment the audience for your event description. For your dedicated members, the people who come to all your events, the title, date, time, and location is all they need. For the fans of your annual event, the person who came up to you and told you how much they enjoyed it and who raved about it to their friends on social media, you also need to let them know if anything that has changed. Remember that happiness is a function of expectations. You don’t want your biggest fan from last year to show up and discover that one of the things they loved the most isn’t going to be a part of this year’s event. The challenge you face, and the audience you should keep in mind as you’re drafting your description, are people who are coming to your event for the first time. It’s these attendees on the margin that you’re writing for. Your competition is the thing that they already know about, whether it’s going to the mall, or out to a movie, visiting friends or taking a walk in the park, reading a book or watching TV, playing video games or posting to Facebook, or any of hundreds of other activities that they’ve done in the past. In addition to the basics . . .
What time does it start and how long does it last? If it’s a day-long event, when do I need to arrive to see the main event? Can I leave early? Who is putting on the event? Is this a good cause? Where will my money go? If it is to support your mission, how is that relevant to me? For an event that lasts for a large part of the day, what are the food options. Why is this event special? Why should I attend now, this year? What accommodations, if any, are there?